Hideaki Anno Interviewed by Atlantic Monthly–by way of Getreligion.org? 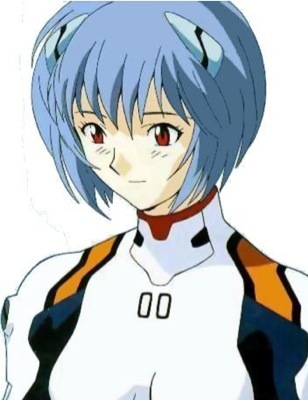 Imagine, of all places, finding a huge picture of Ayanami Rei in a site I read that normally has nothing to do with anime–Getreligion.org, which comments on religious coverage in the media (from a conservative point of view mostly). In person, Hideaki Anno, dressed in a military-green jumpsuit and black boots, slouches deep in his battered office couch and glowers. In a country where conformity is still a virtue, Anno stands out on account of his curly black hair and large, cauliflower-shaped ears, which, in combination with his jumpsuit, give him the appearance of an angry hobbit in black-rimmed glasses. Anno understands the Japanese national attraction to characters like Rei as the product of a stunted imaginative landscape born of Japan’s defeat in the Second World War. “Japan lost the war to the Americans,” he explains, seeming interested in his own words for the first time during our interview. “Since that time, the education we received is not one that creates adults. Even for us, people in their 40s, and for the generation older than me, in their 50s and 60s, there’s no reasonable model of what an adult should be like.” The theory that Japan’s defeat stripped the country of its independence and led to the creation of a nation of permanent children, weaklings forced to live under the protection of the American Big Daddy, is widely shared by artists and intellectuals in Japan. It is also a staple of popular cartoons, many of which feature a well-meaning government that turns out to be a facade concealing sinister and more powerful forces. Interesting. I remember reading similar comments from him in his interviews with various high school kids when he was researching Kare Kano, and this dependent, self-pitying, escapist attitude is one he was actively trying to battle with the conclusion of Eva. He wanted otaku to wake up from their illusions and embrace the real world, though I’m surprised the man who recently directed the remake of Cutie Honey, and is now busy remaking Evangelion, would go so far as to call any adult who reads manga childish. (Though I wonder, given how different Anno is now, how different the new Eva will be. Will it be as depressive as the original?) It should be noted, though, that Hayao Miyazaki–Anno’s mentor–has said similar sorts of things too. In fact, if anything, Miyazaki is even more pessimistic. Children never turning into adults is a growing concern in a lot of modern countries. It’s a troubling thing. I agree with Anno’s pessimism to a certain degree. It is particularly funny what industry he makes a living in considering his world view. In part I wonder if his dissatisfaction is not a reflection of being dissatisfied with his own self? Pingback: Anime Diet » More Anno Gold! Anno + Sixth Graders =…? I honestly doubt that Anno had much to do with RE: Cutie Honey; I think he just approved of everything while the episode directors did most of the work. I think he was much nicer in the Kids video (watch it and see: http://www.reddit.com/r/anime/comments/awq66/buried_treasure_hideaki_anno_talks_to_kids/ ); his _Atlantic_ comments are remarkably harsh. It’s worth noting that they came at roughly the same time as he would have been quitting Gainax to form Studio Khara & start making _Rebuild_. Perhaps he’s unhappy with the anime industry of the 200s, what with its moe obsession and all. mustachioed: thanks for reminding me about that. I actually did see that before but boy that brings back memories. He was talking to kids in 1997, though, which is quite a long time ago. As was this article in the lifespan of this blog! I would not be surprised if his present cynicism about Japan has a lot to do with the moe-fication of anime. Evangelion was, in part, a protest and a sermon against the kind of otaku insularity (represented by Shinji) that a lot of modern anime caters to now. He hoped to open up the world a bit for those who were watching the endings. One also wonders what he might think of Akiyuki Shinbo or SHAFT, who have learned much from his visual style of the 1990s but have put it to use for a lot of the modern, moe archetypes. I think he just needs to relax and get laid.